Repeat expansions in the C9ORF72 gene increase risk for amyotrophic lateral sclerosis and frontotemporal dementia, but scientists have struggled to develop a mouse model that recapitulates the full spectrum of disease symptoms. In the April 21 Neuron online, Laura Ranum and colleagues report a new model that mimics the molecular pathology of the disease as well as some behavioral aspects. A third of the mice develop an acute neurodegenerative disease and die between 20 and 40 weeks of age. The survival curve could make a good readout for preclinical drug testing, suggested Ranum, who works at the University of Florida in Gainesville. Alzforum first reported on these mice from the RNA Metabolism in Neurological Disease conference (see Oct 2015 conference news). The GC-rich C9ORF72 repeats are tricky to work with, and often spontaneously expand or shrink in the bacteria researchers use for genetic engineering. Even so, several labs have taken up the challenge of generating C9ORF72 mice. All the models so far produce expanded RNA and at least some of the potential polydipeptides that are aberrantly translated from it; however, neurodegeneration occurs in only a subset of the mice, and many live normal lifespans (see May 2015 news; Dec 2015 news; Apr 2016 news). Made by first author Yuanjing Liu and colleagues, the new mice have signs of neurodegeneration and behavioral abnormalities in addition to dying young. Liu started with a lymphoblastoid cell line from a patient who carried a C9ORF72 gene containing about 1,200 hexanucleotide repeats. She cloned the full gene, including 52 kb upstream and 20 kb downstream, into bacterial artificial chromosomes and injected those into fertilized mouse eggs to generate the transgenic mice. Due to the instability of the repeat during the process, she wound up with four lines: one with a single 500-repeat insertion; one with the 500-repeat transgene and a 32-repeat version; one with four copies of C9ORF72 carrying either 29 or 36 repeats; and one with a single insertion of 37-repeat C9ORF72. Transgene RNA expression approximated that of the endogenous mouse C9ORF72 gene in all animals, Ranum said. Mice with 500 repeats expressed sense and antisense repeat RNAs, as do people with the expansion (see Nov 2013 news; May 2015 news). Ranum believes the 500-repeat lines will be the best choice for future studies. Searching for the hallmark pathology of C9ORF72 disease—foci containing repeat RNA and polydipeptide inclusions—Liu detected neuronal aggregates containing sense and antisense RNAs when the mice were as young as two months of age. Co-author Amrutha Pattamatta found the mice expressed poly-glycine-alanine (GA), encoded by the hexanucleotide sequence, in neurons throughout the brain, starting at two months. Once the mice reached 16 weeks, the 500-repeat mice started to walk oddly, according to the video gait-analysis program Digigait. About one-third of the females developed progressive disease between 20 and 40 weeks of age. They suddenly lost weight, had difficulty moving their hind legs, and became paralyzed. About half of them died by 65 weeks of age. In contrast, the other females and many of the males developed a milder, slower-progressing disease. Their spines curved in a hunched-back posture typical of other ALS models, and they shied away from the center of a cage, suggesting they were anxious. Some died early, but others lived out a full lifespan. Still other mice expressing 500-repeat C9ORF72 appeared normal at one year of age, and the researchers are following that group to see if they sicken later. When Liu examined the acutely ill mice at end stage, she observed denervation at neuromuscular junctions in leg muscles and in the diaphragm (see image above). Pattamatta found that the mice had fewer neurons in the spinal cord, motor cortex, hippocampus, and cerebellum than controls; for example, motor neuron counts in the spinal cord were less than a third of those in non-transgenic mice. The surviving neurons accumulated more and larger poly-GA aggregates than seen in young mouse neurons. Poly-glycine-proline (GP) inclusions as well as the TDP-43 aggregates that are typically associated with ALS appeared as well. 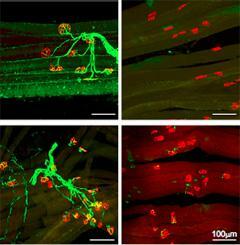 Neurodegeneration was milder in mice with the slower-progressing disease. They were 78 weeks old before they lost similar numbers of motor neurons as the end-stage acutely ill mice, however, they retained more cerebellar neurons and their hippocampi were unaffected. Ranum sees the phenotypic variability as an advantage, since it reflects the incomplete penetrance of the repeats in people. One scientist estimated that one-tenth of carriers will develop symptoms by age 50, and three-quarters will by age 85 (see Sep 2012 conference news). “[These mice] recapitulate the variation we see in the human disease,” Ranum said. “If we can understand why some mice do not get sick, maybe we can understand why people go along with this [C9ORF72] mutation for decades, and then develop this motor neuron disease or frontotemporal dementia.” Between the survival curves, gait abnormalities, and neuropathology, she thinks it will be possible to assess the effects of therapeutics in the model, which she plans to make available via Jackson Laboratory in Bar Harbor, Maine. Why do these mice have more of a neurodegenerative phenotype than other C9ORF72 lines? “We are eager to compare the models and figure that out,” Ranum said. She noted her lab used FVB mice, instead of the Black 6 many others used. Plus, the BACs contained the whole C9ORF72 sequence, whereas some other models relied on BACs with partial constructs. “That might affect the regulation of the sense or the antisense transcript,” she speculated. Liu Y, Pattamatta A, Zu T, Reid T, Bardhi O, Borchelt DR, Yachnis AT, Ranum LP. 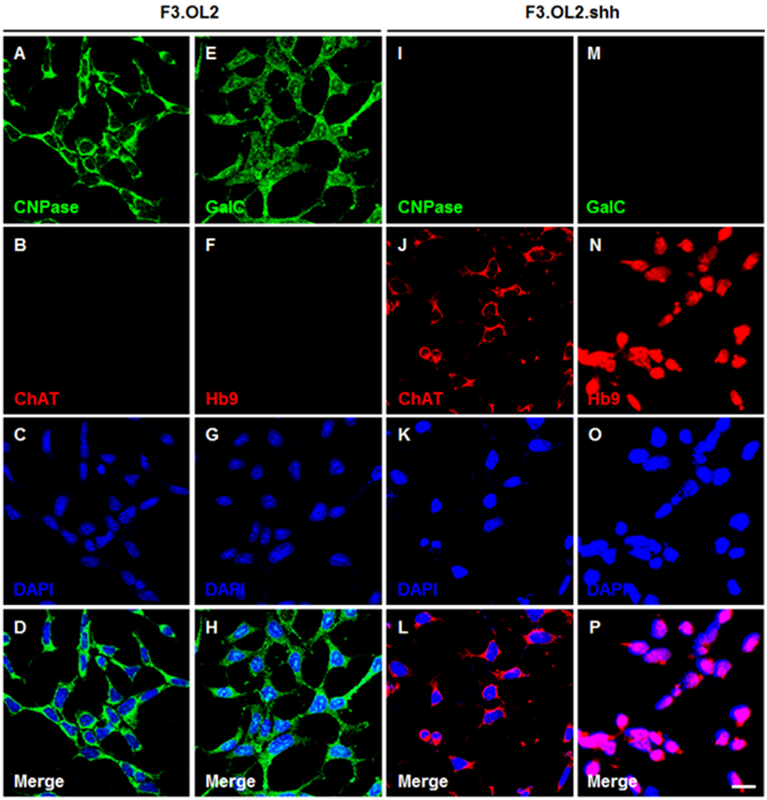 C9orf72 BAC Mouse Model with Motor Deficits and Neurodegenerative Features of ALS/FTD. Neuron. 2016 May 4;90(3):521-34. Epub 2016 Apr 21 [PubMed].